I decided to, at last, use 1Blomma's tutorial on making maps with Photoshop and Illustrator, and here (many frustrating hours later) is the result. I think it ended up pretty well for a first time attempt at the program, and hopefully all of you enjoy. 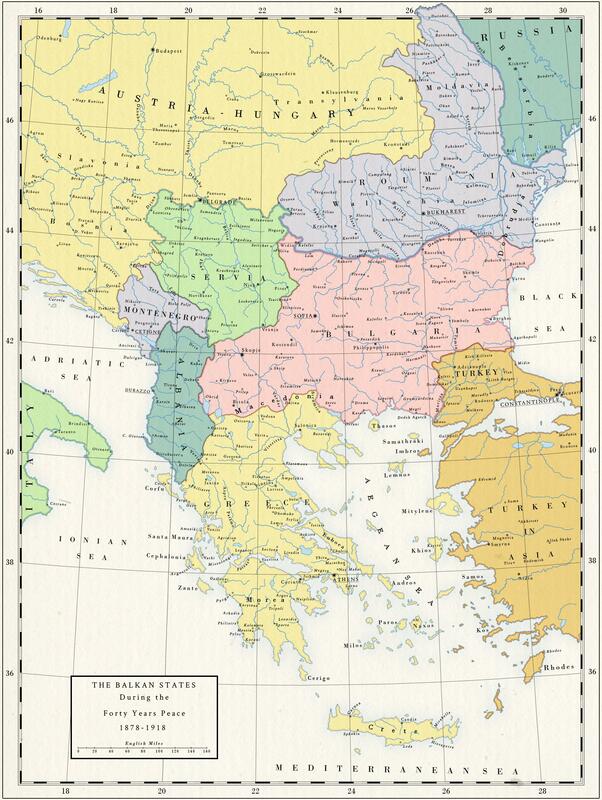 The basic background of the map is Dimitiar Obshti does not launch a daring raid on the Ottomans in 1872, which causes him to eventually end up in Bucharest instead and leaves Vasil Levski, the great Bulgarian revolutionary, free and uncaptured by the Ottoman Empire. Instead, Levski spends the years leading up to war plotting and gathering strength, and when war does erupt for Bulgarians, they win an even more smashing victory over the Ottomans than in our world, quickly taking Macedonia, parts of Serbia, and threatening Constantinople before supplies force them back. Unlike in our world, where the Treaty of San Stefano that granted Bulgaria Macedonia and more was repealed, here Bulgaria gets to keep most of the land it took in the war. Though it does give up some lands to the Greeks and Serbs in exchange for their support of Bulgaria's enlarged borders. They also help Montenegro enlarge itself and Albania establish itself as a nation as the Ottomans, long before in our world, are forced into only a tiny bit of Thrace in 1878. Following their victory, Bulgaria is nicknamed "the Prussia of the Balkans" due to its victories and rapid economic growth due to industry, increased commerce, and progressive fiscal policies that make Sofia the economic hub of the Balkans and Bulgaria the most advanced nation in the region. For 40 years of peace Bulgaria grows and dominates the area, making itself a middle power and a cultural giant as a new renaissance of Bulgarian art, music, theater, and more sweeps through the nation and the Balkans.